The Tiny Bobbles Stitch II is a multi-color version of the Tiny Bobbles Stitch. For those of you who are looking to add extra color to your Tiny Bobbles Stitch pattern, this stitch is what you’re looking for. 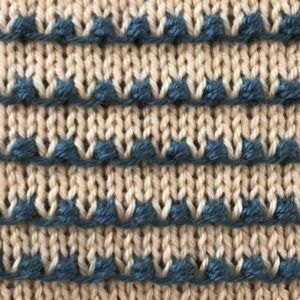 This stitch pattern is suited for edgings and extra detail add-ons to a larger piece. The first four rows will be knitted in Color A (yellow) and the last two rows will be done in Color (teal). Pattern remains the same as the original. Row 3 (Color A): knit. Row 4 (Color A): purl. Row 5 (Color B): k1, *(k1, yo, k1) into the next st, sl 1 wyib; rep from * to the last st, k1. Row 6 (Color B): p1, *sl 1 wyib, k3tog tbl; rep from * to the last st, p1. (slip) 1=slip the next stitch onto the right-hand needle without knitting it. (with yarn in back)=This term is used when the yarn is at the front of the work (after a PURL stitch has been performed) but has to be put to the back before the next action is performed. Take the yarn from the front to back between the two needles.